A practical and in-depth program to deepen your Yin yoga practice and learn how to teach creative, injury-free, safe Yin Yoga classes. After completing José’s 200 hours of yin yoga & anatomy training you will be able to teach, adapt and practice Yin yoga in a personal, safe and inspiring way. You will master (energetic) anatomy and its practical application to personalise the yin yoga practice. Broaden your physical, energetic and emotional understanding of Yin yoga. Find your voice, increase your self-confidence and learn how to share your love for yoga. José will guide you in deepening your practice and bolstering your skills to become a confident and creative teacher. To become a source of inspiration begins with your own personal yoga practice, both on and off the mat. Yoga is not just physical, it’s a practice of the heart, mind, and spirit. Be prepared to discover your mental and physical tendencies through this journey. José’s Yin yoga program (est. 2015) is one of the Netherlands top teacher training for yin yoga. José sets a standard for quality in training and with the result: her graduates are confident, creative and are able to adapt and personalise the practice to the student’s needs. Learn how to practice yoga poses functionally (Feeling and experiencing the benefits of poses), instead of practising them aesthetically (showing or doing poses the way they should look like). You will study 35 Yin poses (20 lower body yin poses and 15 upper body yin poses) and what they can do for the body and energetic balance. 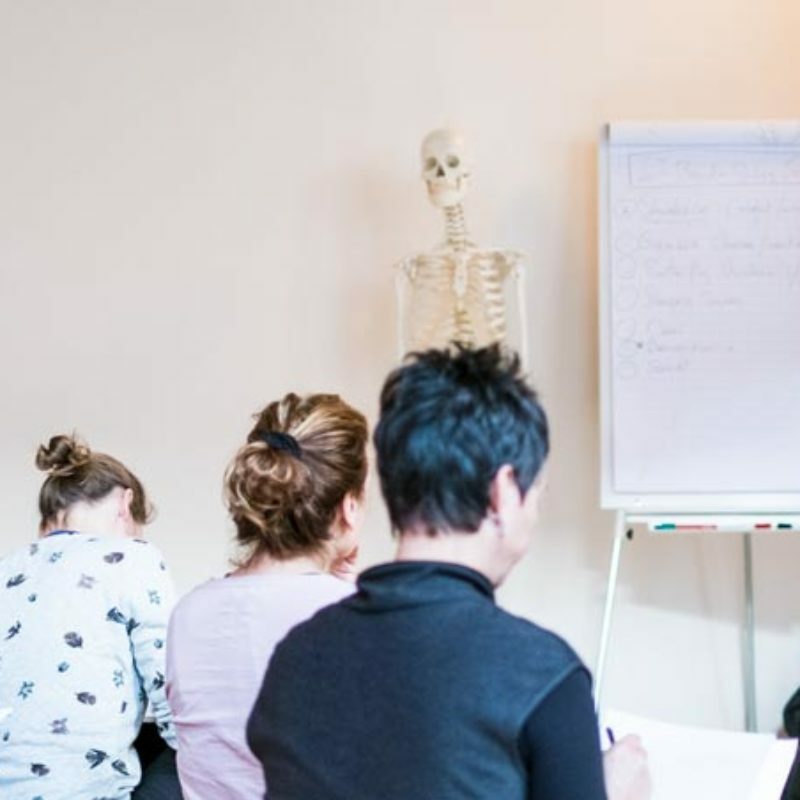 In a fun and practical way we will learn how the body functions physically and energetically by studying anatomy (bones, muscles, fascia, joints, movements, organs and connective tissue) and meridian theory (chi, meridian pathways, 5 element theory). Deepen your own practice and learn how to allow your students practice in a personalised manner. Practically use the anatomical and meridian knowledge to enable yourself to see and respond to people, their unique bodies, and their potential. Learn how to use props and give personalised adjustments in order for your future students to get a beneficial yin practice without unnecessary pain nor injuries. How to intelligently sequence and teach safe, personalised and creative yoga classes that are inspirational. Deepen or enhance the healing effects of the Yin practice and to feel and guide the chi flow. Learn how to be in the moment and how to observe without action or reaction by practising meditation; which supports your Yin practice. Basic understanding of the Chinese Medicine, Taoism and Yoga Sutras, to give insight in your constitution and how to restore physical, emotional and mental imbalances with Yoga poses, Meditation, Pranayama, Nutrition and a certain the way of life. It will give you tools to teach your classes on a heart-mind level. To teach yin yoga means you practice yin yoga and meditation. José and guest teachers encourage you to deepen your own yin and meditation practice, through experimentation, reflection and guidance. We will also give you lots of experience to feel and deepen both practices. For yin yoga you learn the (energetic) anatomic principles of the practice combined with intelligent understanding of how to adapt the poses to your physical, emotional and/or energetic needs. You will also learn to meditate, using your own experiences and supporting theory. To bring your practice and that of your future students on a heart-mind level, you will be introduced to the essential basic concepts and application of both the Yoga Sutras and Taoism/Meridian Theory. Anatomy, Physiology and Energetic anatomy (chi and meridians) of the human body is the foundation of this training. It is also the foundation for teaching safe and personalised Yin yoga classes. Learn about bones, movements, joints, muscles, fascia, connective tissue, organs, meridian pathways and chi. We will also discuss specific ailments. You will learn how to use this anatomy knowledge in analysing what’s possible, or not, for your students, offering personalised adjustments and teaching functionally (how a pose is experienced) instead of aesthetically (how the pose is performed). You will learn and study the language of the body, how to respond to individuals and situations while you keep on teaching the other students. Develop your verbal and non-verbal instruction, visual demonstration, touch, assist your students to meet their needs. Learn how to teach safely and creatively in beginners, multi-level and experienced classes including attention to the breath, lifestyle and the principles of yoga. Let’s be honest, this course is challenging! Before and during the program, you should take into account additional time to be dedicated to self-study. You will be asked to read a lot, practice a lot, and prepare assignments. You will start practising teaching and adjusting immediately in your own environment, reading a number of books, watching Dvd’s, and will meet your study group regularly. We want you to grow, so we integrate personal feedback of your practice, teaching and adjusting all the way through. You will get to know the trainers and they will get to know you. In the middle and at the end of the program you will have a few points of final evaluation, including your practice, theory, and an evaluation of you teaching a class. We encourage you to attend and observe as many classes as you can. Not only with the trainers from the teacher-training program but also other Yin yoga teachers. To be introduced to a wide range of varieties in which yin yoga can be offered. We offer sufficient contact training hours for a YA certification and we ask for a serious commitment from students. Upon successful completion of the program, you can register with Yoga Alliance as a RYT 200 (internationally recognised Yoga Teacher certificate). This 200 hour Yin & Anatomy Teacher Training is spread out over 14 or 18 months. After the first 100 hour block, you will have some months to practice and apply what you have learned in the first half of the training, in order to prepare for the second half of the training. Taking time to complete this training will ensure you to get enough practice time in teaching, adjusting and making the teachings your own. The first part focuses mainly on the physical aspects (movements, skeleton and muscles) of the Yin practice, and gives you a solid foundation to teach and adjust the 20 lower body yin yoga poses in a safe and personalised manner. Daily meditation, pranayama (6 techniques) and Yin yoga practice (20 lower body poses). Theory and Practice in Anatomy and physiology: studying bones, joints & movements; muscles, muscle groups and fascia of the hips, legs and torso. Learning how to assess the anatomical differences between people and how to apply that in the Yin Yoga practice. Learning how to strengthen and stimulate the body in a healthy manner. Practice in teaching and adjusting the 20 lower body poses. Practice in the usage of props. Training to teach safe and personalized Yin yoga classes. Basic principles of Taoism and Chinese medicine. The second part focuses mainly on the energetic, emotional and healing aspects (meridians, chi, organs & emotions) of the Yin practice, and allows you to teach and adjust the 15 upper body yin yoga poses in a safe and in-depth manner. Study of the necessary Sutras. Theory and Practice in Anatomy and physiology: studying the upper part of the body (muscles of the arms & shoulders), reviewing of the lower part of the body (hips, legs, torso) and an in-depth study of connective tissue, fascia and organs to understand the energetic anatomy of chi and meridians. Theory and Practice in Energetic Anatomy: studying meridians, meridian pathways and their connection to the organs and elements (water, wood, fire, earth, metal). Understanding of energetic anatomy and a healthy functioning of the body and mind. Learning to recognize various forms of Chi – physical, mental and emotional reactions – and the ability to determine if they are in balance. Learning how to use the 35 Yin Yoga poses to balance any blockage, excess or deficiency of Chi in the meridian pathway. Daily meditation, pranayama (6 more techniques) and Yin yoga practice (15 upper body poses). Practice in teaching and adjusting the 15 upper body poses. Practice in usage of props. Training to teach safe, personal and in-depth Yin yoga classes. You can expect practical & down-to-earth information to apply as a teacher and we will provide a wide variation of yin yoga classes deepening and inspiring your own practice. Explore your breath and learn how to teach pranayama, to deepen or enhance the yin practice. Learn to observe without reacting, using meditation practices. Opportunities to teach, adjust and observe, coached by José and guest teachers. Working with José and guest teachers will allow them to really get to know you personally and your practice. I'm not sure if I want to be a yoga teacher yet. This 200-hour training is great for those who want to delve deeper into the study of the anatomical and energetic theories of yoga, and to improve their own practice. It is also great for students who simply want to have a transformational experience and to be a part of the Yoga Community. But be prepared to look at the practice from teachers point of view. How 'good' at yoga do I have to be to do the 200-hour program? We require that you have a minimum of 6 months of a significant exposure to yin yoga before enrolling in this teacher-training program. We want to make sure that trainees have a good basic foundation in practising Yin yoga postures before learning how to teach. Better even is to have been practising for 1 year or more. In principle, you have to have at least 6 months of a committed personal practice and participation in several classes of either José or other yin teachers. Online classes are not included unless there is no other option (please discuss the options with José). Apart from taking regular classes, we advise you to take José’s online classes, master classes or participate in a Yin Yoga & Reiki retreat, to prepare for the training. For these, please sign up by contacting José. Browse all of José’s events here. Able to manage a daily 1+hour yin asana practice, have a regular yoga practice. Why is the 200 hour program set up in two parts? José and the other trainees find it important for you to have enough time to practice, digest, study and integrate all that you have learned throughout the 200 hours. Therefore you have time in-between the first and second half of the training and in-between the contact days. This gives you more time to do all the homework and assignments, meet with your study groups etc. But most importantly, you will have time to develop your own practice – patience and time are key especially in yin yoga! During the first half of the training (100 hours), you will learn the basis for teaching yin in a safe way. The focus is mainly on the physical aspect of the practice, providing a strong and solid foundation for teaching and adjusting Yin yoga poses. Then you will get another some months to study, practice and deepen your abilities to teach and adjust, before diving deeper into the more subtle aspects (energetic, emotional and mental) of the Yin yoga practice in the second half of the training. The progress will be supported with the necessary guidance. It is important to note that the 200-Hour format meets the required Yoga Alliance standards as specified on their website, www.yogaalliance.org. Attendance of all in-class teacher training sessions. You may miss 2 days of the 200 hour training in order to be still eligible for the certificate, if agreed with your teachers. Successful completion of homework, assignments and theory exams. Participation in the two final practical exams in the middle and end of the course. The practical exams are decisive for a certificate, the theoretic homework assignments are not. As teaching and adjusting shows that you can apply what you have learned during the training. Sometimes it can happen that students haven’t sufficiently completed all the above mentioned aspects to acquire a certificate. In that case, if a certificate is wanted eventually, certain aspects of the training have to be retaken anew. The options will be given to you specifically by José. If the anatomical and subtle theories are not sufficiently applied in the practical class, you can participate in the yearly planned exam day outside of the training. Your feedback form will indicate what you have to improve. Of course; if you have signed up for this training in order to deepen your practice, you don’t have to follow the requirements given to obtain a certificate. When you have successfully completed the teacher training you will receive a 200 hour certificate certified by Yoga Alliance. You can then register with Yoga Alliance. Expect between 4-8 hours a week on homework (reading, watching, writing, assignments, practice teaching). The homework is designed to support the material covered in class and help you integrate what is presented into your own practice and teaching. Expect to meet with your study group approx. 1-2 times a month for a couple of hours. You will have a much deeper experience when you meet with colleagues to practice your new skills. Will I be qualified to teach yoga once I complete the training? Yes! Graduates of the 200-hour program usually begin teaching in small studios, gyms, with private clientele (friends and family), etc. Many new teachers decide to continue their Teacher Training education and participate in other training as a way to further solidify their skills, knowledge, and style as a yoga instructor. José highly recommends this as different teachers have different qualities and specializations from which you can learn. Lets us help you! Send us a message and we will happy to answer all your questions. A useful training for everyone that wants to learn more about yin yoga. It provided in-depth knowledge of the human anatomy, helping me to practice and teach yin yoga (safely). The way the learning material was taught - the classes, quizzes and assignments - was very useful to understand, learn and apply everything. I have learned to look at yin yoga in a functional way and let go of the esthetical approach. I definitely learned that every body is different and that we all need something else! I wanted more knowledge about anatomy and Jose explained it in a way that things fell into place so easily. I feel like I’m better able now to help my students, understand and work with their own bodies in a safe way.